Step on board Athens Day Cruise’ one day cruise from Athens and step into a world of authentic Greek experiences. Pure fun, cultural inspiration and culinary delight await you on a journey of the senses, island hopping to Hydra, Poros and Aegina. You’ll feel the true spirit of the Aegean lifestyle on board Athens Day Cruise 3 deck cruise ships designed for your every comfort and convenience. 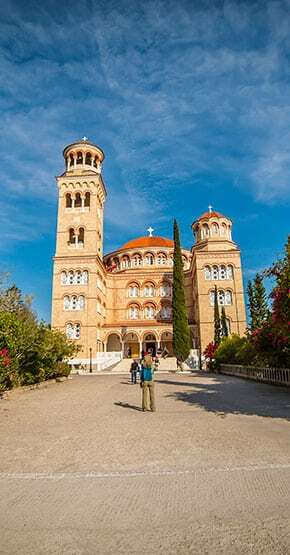 A live orchestra, Greek culinary experiences, Greek dance lessons, Tax Free shopping and all the fun of a Saronic Gulf cruise are yours to enjoy. 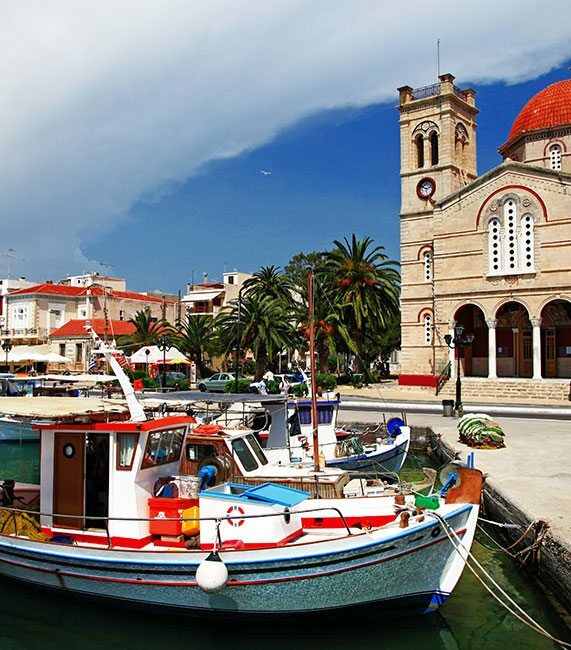 From port to port, a cultural journey of discovery awaits you on Hydra, Poros and Aegina. Each island has a history of its own and unique character. The Saronic Islands are renowned in Greek history for influencing events throughout the ages. 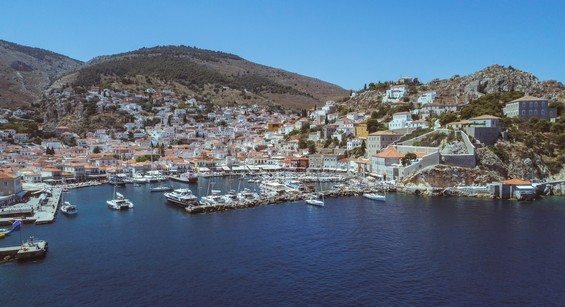 You’ll discover historical facts and uncover the hidden secrets of the islands (on Hydra, the hillside houses were built to defend the inhabitants against pirate attacks) and, of course, beautiful beaches and island hospitality. No journey is complete without a taste of the local cuisine representing generations of tradition. An amazing array of delicious sweet and salty specialties made from the fruits of the earth satisfy the food lover’s sense of culinary adventure. Dining, music and dance are the essence of Greek lifestyle from morning till night. Aboard Athens Day Cruise’ one day Saronic Island cruise, life on board is carefree, with every opportunity for relaxation and entertainment. Socialize in the party atmosphere of our Sun Deck sipping your favourite drink and learn Greek dance joining the lively circle of adventurous passengers following the steps of our professional dancers for an afternoon of outdoor fun. Once your ship docks, there’s the magic of the Greek islands for fun moments with every step. You’ll enjoy exploring the narrow, winding streets, shopping, as well as interacting with the locals and maybe even learn a few Greek words. On the islands, people-watching is a favourite pastime and you’ll catch the mood for animated conversation over coffee at a picturesque seaside cafe. You will discover the rich history of the Saronic Islands exploring the local heritage. On Hydra, marvel at the island’s unique architectural beauty. There are no cars on the island and the donkey remains the traditional means of transportation. Stone windmills, 350 churches, the mansions of wealthy ship-owners and the Naval history of the island, all inspire. 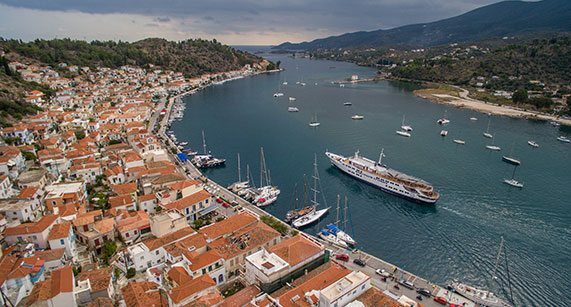 Poros is a beautifully green island distinguished by stretches of lemon groves and sandy beaches lined with pine forests. The town’s archaeological museum, housing displays from the Mycenean era to the Roman period, highlights the island’s long history. The famous clock tower, built on the highest point of the island, is a characteristic feature.Aegina is known not only for its famous antiquity, the 2,500 year-old Temple of Aphaea, but also for its delicious pistachios. The Temple of Aphaea, situated on a pine covered hill, is the highlight of the island’s treasured antiquities. Built in the 6th century BC, it is one of the best preserved Doric temples in Greece. The Church of St. Nectarios is culturally inspiring as a beautiful example of the island’s religious heritage. On board Platinum Cruises’ one day cruise from Athens you will enjoy the authentic taste of Greek cuisine in the complimentary lunch buffet. The Aegean diet is internationally - acclaimed for its health benefits and the fabulous cuisine made from local vegetables, seafood, meat, dairy products and herbs. There is also the option of A La Carte Menu. Every island has its own unique culinary tradition based on local products and the local culinary arts. On all the Saronic islands, you’ll find fresh fish cooked in a variety of ways, fried, baked in a delicious variety of sauces, meat and vegetable specialities, glorious Greek salads and delightful shrimp specialty baked in tomato sauce with feta cheese. If you’re in the mood for just a taste of island fare, there is always a table for Greek ‘mezes,’ a tempting array of hors d’oeuvres (Greek style) with a glass of ouzo. The Saronic Islands are renowned for their special almond biscuits, not to be missed. And, of course, Aegina, with its world famous pistachios, surprises the most cosmopolitan food lover with a variety of pistachio temptations unique to the island.